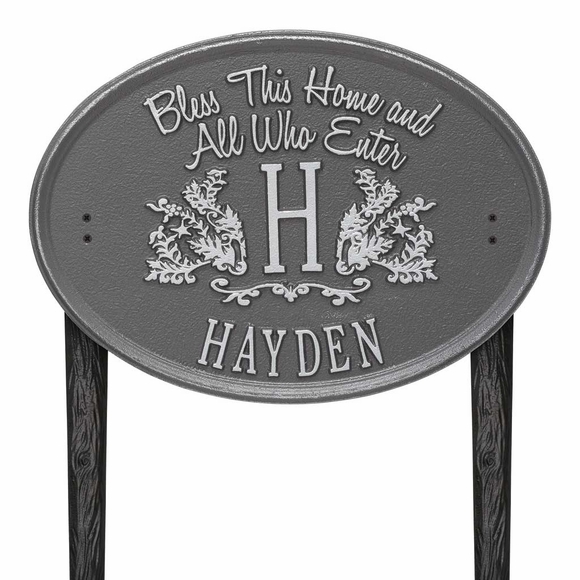 Bless This Home Lawn Sign with Monogram - - features the family name and one initial monogram you supply along with a daily prayer of blessing for family and guests. "Bless This Home and All Who Enter," in a stylized script font, is standard on this sign. Oval shape aluminum sign for lawn mount. Includes two lawn stakes for convenient setup. Floral accents highlight your initial in the center of the sign. Your family name on Line 2 is printed in all capital letters as shown and holds up to eighteen (18) 1.25" characters. Dimensions: 14.5"W x 10.35"H x 0.375. PS pewter with silver characters; (shown in large image). Shown in small images from left to right: AB antique bronze; AC antique copper; BG black with gold characters; BV bronze verde; OB oil rubbed bronze; and OG bronze with gold characters. Monogram, family name, accents, and border are permanently cast into the sign. To purchase a wall-mount version of this sign, click top link in Related Products.